Recently I started painting miniatures and (having academic art background, accustomed to european naming of colors: http://en.wikipedia.org/wiki/List_of_RAL_colors), have significant problems finding correct color, specifically ultramarine blue. All hobby lines have their own "strange" names. Ultramarine blue is defined as 0F7BB3 In RGB. Which information are you exactly search for? I'm having problems with various hobby line color-naming systems. I'm trying to find ultramarine blue in new citadel range but there is none. Can't find it at my game store and they have complete set. There is no ultramarine color equivalent in citadel range of colors. This isn't just an issue with this particular color and manufacturer. The other manufacturers whole lines have some crappy names which can be deciphered only after you buy and try and waste money on that trial(their printed materials are not accurate!). Vallejo has similar naming system but it's out of my reach currently. Most manufacturers post color conversion charts. Just search for (insert brand) color conversion chart. Official Paint Conversion Chart for the new Citadel Colours Utramarine blue is Altdorf Guard Blue. Utramarine blue is Altdorf Guard Blue. Bear in mind that ultramarine is a traditional paint colour and isn't the same shade as Citadel used to sell called "Ultramarine Blue". 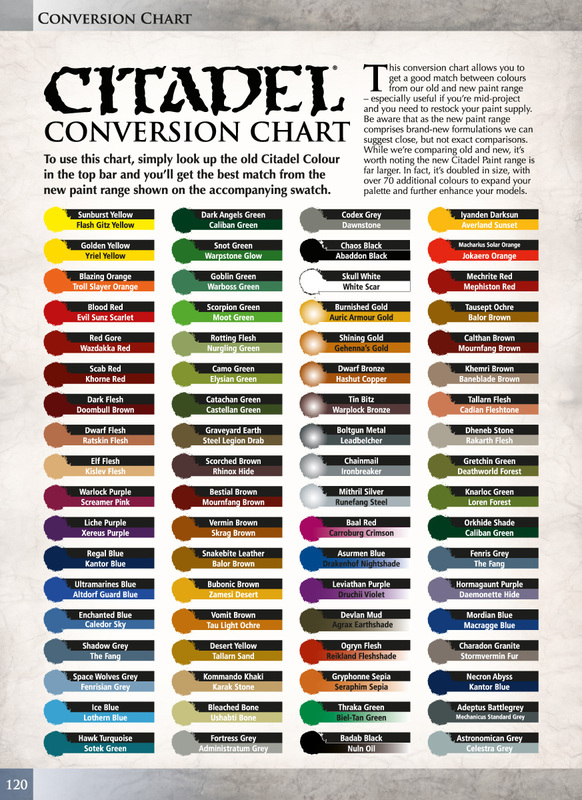 That chart looks to me like it's converting old Citadel paints to new Citadel paints, not between Citadel and the colour names that everyone else uses. At some point you have to let your eyes be your guide. exactly my point. there are systems in use for centuries, and modernized ones, for decades. Just paint them sky blue and be damned. My Dark templers are painted black not what ever soding shade GW calls black. MY praetorians are painted scarlet, not Thingwobbel red or whatever stupid name GW has given red. http://hamptonroadsscalemodelers.com/wp-content/uploads/2014..., 55 looks damn close. Besides why does it matter, just say they are in winter or summer scheme. Yes, that's because the Vallejo Game Colour line is specifically named to be reminiscent of the Citadel paint names of the 90s, so that people can use them as Citadel-replacement paints more easily. Citadel misnamed one of their paints 'Ultramarine Blue' because they called one of their Space Marine chapters 'Ultramarines' (presumably to give the impression that they were Very Damn SpaceMarines?) and then painted them sky blue for some reason best known to themselves. If I had to guess, it's probably that they started off with an Ultramarine colour, but as mini-painting standards evolved they started using more dramatic highlighting and the colour shifted to a lighter shade as a result. Or they wanted to make the armour look like it was painted Ultramarine and reflecting a lot of light, and sold "Ultramarine Blue" as the paint you should start with before giving it a heavy ink wash. There's a traditional colour shade called Ultramarine made from powdered Lapiz Lazuli and is a similar colour to blue fountain pen ink - like a darker, more-purply cobalt blue; IIRC the nearest old-GW paint colour to it was Regal Blue... which is a surprisingly fitting name for Citadel, since original Ultramarine was hideously expensive. It's all very well saying that you should use your eyes, but since a lot of model paints come in opaque or at least not-perfectly-transparent-and-colourless bottles and some of them need vigorous shaking before you can use them, you don't generally get to see the true colour of the paint until you've already bought it, unless your local hobby shop is generous enough to have painted sample dots of everything out on display. Off topic: I've met a few miniaturists who sometimes paint their figures with oils, but those take a long time to dry so doing a set of them can take seemingly forever. But there is an undeniable luster and richness in color of the finished pieces. That's how I approach painting miniatures: colors on the box/in the book are suggested. Just dive in, do your best, and get 'em done! Exactly! Earache suggested and I bought " Altdorf guard" but its not ultramarine. Since its one of the unique hues (and very vibrant) I can't reproduce by mixing other colors so exactly that one is needed to reproduce and enjoy wanted effects, don't want to buy a whole offered spectrum. The model paints have a very fine pigment and it's hard to mix it with some student acrylics I have like "liquitex BASIC". I guess "pro" line will suffice. Also "Regal blue/Kantor" is "prussian blue", tested. Also I bought acrylic retardant to try that too, in hope I'll achieve oil paint effect on minis but faster.